HIGHLY SOUGHT AFTER FIVE FORKS LOCATION!! This beautiful custom home is minutes from Five Forks and Woodruff Rd shopping and dining. Just a short drive to 385 and downtown Greenville. 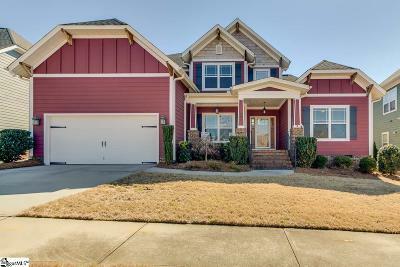 Outside the colorful concrete plank craftsman exterior, the covered front porch and well manicured lawn will not disappoint. The HOA dues includes lawn maintenance, so spend your time gathering with family and friendly neighbors. You will love the carefree lifestyle. Inside the two story foyer is a show stopper. The gleaming hardwoods, open floor plan and large windows bring in the natural light. The two story great room features a double sided fireplace and 6 large windows. The dining room is large enough for dinner guests and features more hardwood flooring with chair rail molding. The chef of the home will LOVE the beautiful gourmet, well appointed kitchen with a 5 burner gas cooktop, wall oven, cherry cabinets, granite counter tops, soft close cabinets and drawers, pantry and breakfast area. The doublesided fireplace seen from the kitchen adds ambiance. The large master bedroom is on the main level and boasts two walk in closets and a full bath with double vanities and a zero entry level tiled shower. There is also an additional bedroom and full bath perfect for guests or in-law suite. The laundry room is on the main level for added convenience. Upstairs there are three more nice sized bedrooms with walk in closets and two full baths. One bedroom has a private bath and could be used as a second master bedroom or guest suite. You will love spending your free time outside on the screen porch or grill on the deck overlooking the partially fenced back yard. This home has been lovingly maintained and is move in ready. Call today for a private showing.